A Pahiatua farmer is pleased his family dairy farm is still in the family because it allows him to enjoy his passion for south devon cattle. Kate Taylor paid him a visit. Pahiatua south devon breeder Mark Eagle talks enthusiastically about the temperament of his “gentle giants”. We pride ourselves on breeding cattle with quiet temperaments and a decent strong, meaty carcass,” he says. Mark and Di Eagle and their Kaimoa South Devon Stud can be found on the 230-hectare Chessfield Farm in the Mangaone Valley about 11 kilometres south east of Pahiatua. Their annual bull sale is on May 23. . .
Primary industries production remains crucial in Southland’s future. That was the message given to farmers at the Federated Farmers annual meeting on Wednesday at Bill Richardson Transport World. Speakers and leaders had farmers thinking about what farming in Southland would be like within the next 10 years. Southland Federated Farmers president Allan Baird said his desire for the future would be to have a healthy environment alongside a growth in production. . .
Director of Biosecurity and Animal Welfare Julie Collins has been pleased with the amount of feedback MPI had received to date. . .
A central Hawke’s Bay company has signed a deal to sell its solar powered water pump in 20 countries. Isaacs Electrical launched its ePump last December, and strong demand nationally and internationally has led to it signing a major distribution partnership with Waikato Milking Systems. The ePump can pump up to 20 litres of water per minute in daylight hours, and for a distance of up to 120 metres, making it ideal for use in remote locations. . . Dairy farmers facing the industry’s lowest milk price in years will this month hear lessons learnt by the kiwifruit industry when Psa struck in 2010. “We are different industries, but we are still people. One looks after animals, one looks after plants – but we are people, we have passion, we have drive, we earn our income and live our lifestyles this way,” says Ian Greaves, kiwifruit industry representative. The kiwifruit vine disease, Psa, devastated all Gold kiwifruit orchards across the Bay of Plenty but also affected Green, with many growers only now getting their first or second crop since it occurred. . .
“As rats increase due to the readily-available food source, so will the number of stoats which feed on rats,” Ms Barry says. “Once the seeds germinate and the food source disappears in early spring, the plague of millions of starving rats and tens of thousands of hungry stoats will turn on native wildlife, bringing disaster if we do nothing.” . . This months meeting of NZ Landcare Trust’s Board of Trustees will see a new face at the table, as Fiona Gower takes over from Liz Evans as the representative for Rural Women New Zealand. Fiona is looking forward to the new role. “With the growing importance, emphasis and pressure on freshwater in New Zealand, organisations such as NZ Landcare Trust will play an increasingly important role in achieving positive outcomes for our land and water resources, and I am looking forward to being a part of that journey,” Fiona added. . . The Farm At Black Hill is the story not only of the farm and the families who farmed it. Most of all it is a memoir of the very full life of Beverley Forrester, a woman who, as she quips to one of her staff, is not afraid of hard work. Beverley was brought up on a farm on Matakana Road, near Warkworth, by parents who modelled a strong work ethic and taught their family the importance of community involvement. She trained as an occupational therapist and soon after graduating was appointed charge OT at Templeton Hospital. While working in various posts as an OT, Beverley continued to follow her interest in coloured sheep. An invitation to judge at the Cheviot Show led to a meeting with Jim Forrester and she moved to Black Hills. The marriage was a happy but short one. After just 10 years Beverley was widowed and found herself in charge of the farm. Eventually she had to accept Black Hills was too big for her and she sold most of it to focus on other work. She and her staff undertook the restoration of the farm’s historic limestone buildings which became a tourist attraction. 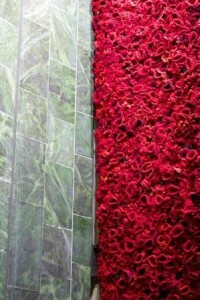 She also followed her passion for wool. English cousins helped her set up a shop in Henley-On-Thames. She exports to several countries, has her own fashion label and her clothes have been shown at New Zealand Fashion Week. Beverley writes in a matter-of-fact style on everything from dagging sheep to meeting royalty. I finished this book in awe of what she has accomplished. You can find out more at her website Black Hills. 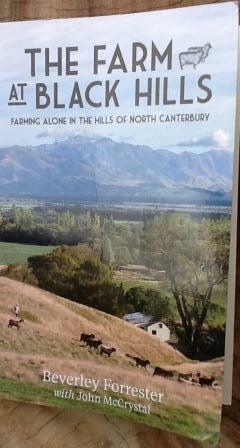 The Farm AT Black Hills, Farming Alone in the Hills of North Canterbury by Beverley Forrester with John McCrystal, published by Penguin Random House. All royalties from the book are being donated to Rural Women NZ.